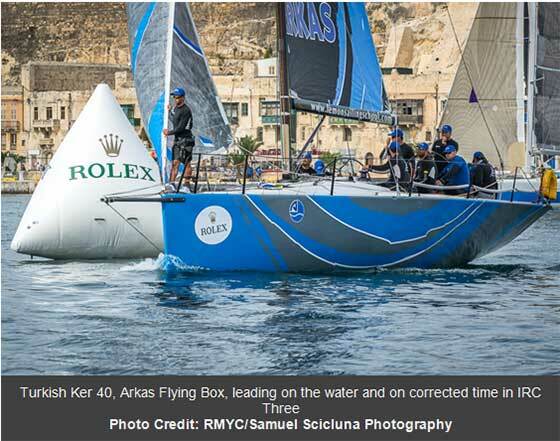 Last night produced one the most dramatic finishes in the history of the Rolex Middle Sea Race. Two yachts finished within sight of each other vying for the overall win in IRC for the Rolex Middle Sea Race Trophy after over 600 miles of intense racing. Michele Galli's TP52, B2, crossed the finish line outside the Royal Malta Yacht Club just before midnight, to take first position in the overall rankings but there was a nervous look about the crew. They scanned the darkness outside Marsamxett Harbour, looking for the masthead light of Vincenzo Onorato's, Cookson 50, Mascalzone Latino. As their Italian rivals came into view, the tension was obvious on board B2. Mascalzone Latino crossed the finish line just after midnight and stopped the clock. 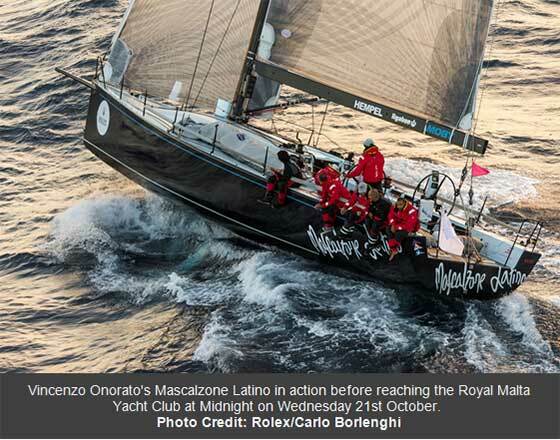 After three and half days and nights at sea, B2 corrected out to beat Mascalzone Latino by an astonishing seven seconds. 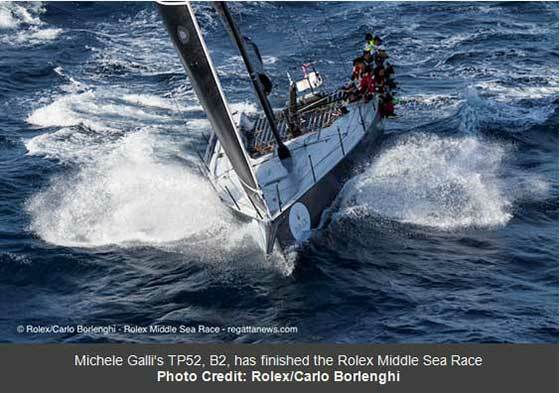 Michele Galli's TP52, B2 is now the provisional overall leader of the IRC fleet, vying for the Rolex Middle Sea Race Trophy. The vast majority of the fleet are still racing but it is most likely that the corrected time, set by B2, will not be bettered. Mascalzone Latino's navigator, Ian Moore, was obviously disappointed with the result but upbeat about the performance of the team. "This is the first time we have sailed together as a team for over a year and we put in a great performance, so we can be happy with that but to be beaten by such a small margin is never nice." commented Ian Moore. "Our team and the boat performed well over a broad range of conditions, and we especially made big gains in the light winds. B2 was always going to be quicker than us in a straight line and they did well in the transition zones at Stromboli and Capo San Vito. We did catch up 14 miles on the first night going past Mount Etna, which was a big gain for us. On the leg from Lampedusa to the finish, there were a lot of thunderstorms and we saw one wind shift of 50 degrees, which we got spot on. Of course there were lots of occasions we could think about where we could have gained those precious seconds but this was an exciting race for us and tactically extremely difficult." In IRC Three, the leaders have made a clean getaway from the rest of the pack with the Turkish team racing Ker 40, Arkas Flying Box, leading on the water and on corrected time from Bastiaan de Voogd's Dutch Sydney 43, Coin Coin. Vittorio Biscarini's Italian team racing Ars Una are lying third. The trio are passing Lampedusa, with approximately 100 miles to go and are expected at the Royal Malta Yacht Club tonight. In IRC Four at Favignana, Chris Opielok's Corby 36, Rockall IV, was leading after time correction. Just three minutes behind the leader was Sonke Stein & David Anastasi's, Maltese J/133,Oil Tanking Juno. By Pantalleria, Christoph Podesta's Maltese First 45, Elusive II BOV had over taken both yachts on time correction to take up the running. In IRC Five at Favignana, Lee Satariano & Christian Ripard's Maltese J/122, Artie held a narrow lead of just 16 minutes on corrected time from Laurant Charmy's French J/111, SL Energies Groupe Fastwave. However by the time the leaders passed Pantalleria, Costantin Manuele's First 40.7 Canevel Spumanti had over taken both yachts after time correction. In IRC Six, Milan Hajek's Czech Republic Team, racing First 40.7, Three Sisters holds a commanding lead over Peppe Fornich Italian Grand Soleil 37, Sagola-Biotrading and Gherardo Maviglia's Amapola.